The broad scope of the different sectors which would fall under the remit of ‘catering and hospitality’ is vast not only in terms of the different types of environment you might end up pursuing a career within but also the level to which you may need to study and train. You could find yourself working in any type of establishment in which food or beverages are served so that could range from Michelin-approved restaurants to pubs, clubs, hospitals, workplace canteens, schools to even running your own burger van! Therefore, the opportunities and diversity are very broad indeed. Such is the broad nature of this particular industry and also, given that it tends to employ people from right across the spectrum in terms of their level of training, this also means that it’s a very transient sector which means that whilst many people will carve out a particular niche career path for themselves, there is also a great deal of movement too with a lot of people only staying in jobs for a short period of time before moving on (usually those towards the lower end of the skills spectrum). Therefore, as an industry as a whole, the catering and hospitality sector is always on the lookout for skilled professionals who they can hope to keep hold of and who can attract and retain others who might be working under their supervision. Because the entire sector is so diverse, the range of qualifications you would consider to enter a particular career will also reflect that. For example, if you’d prefer to work in a pub, club or wine bar, for example, you might be involved with event management, promotional activity and licensed retail. Then a hotel would incorporate a full range of career options from cooking and food operation itself, housekeeping, banqueting and conference management to a whole range of operational roles such as in finance, HR and marketing. 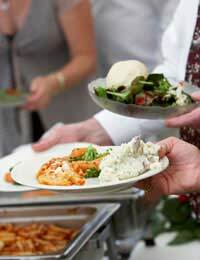 You might also find yourself working within a company who have been contracted to supply the catering for a particular workplace, a hospital or, perhaps, a school. Corporate entertainment is also huge business these days which might see you working as a welcoming host to a sports gala evening or looking after corporate guests at a sporting or other kind of entertainment venue. Therefore, in that event, you may need to undertake a BTEC qualification in Hospitality or you might need to obtain NVQ level 2 as the minimum to work within even a basic catering role. A university degree might be necessary if you intend going into Operations, Finance, Marketing, HR or, perhaps, Facilities Management. In fact, the list is endless. Some courses will be undertaken on a full-time basis whilst others might consist of vocational learning on a part-time basis combined with on the job training. For a lot of the occupations within the catering and hospitality sector, you might also need to undertake a specifically related Health and Safety qualification as well. In addition, as the vast majority of roles will involve dealing with members of the general public as well as special guests (often including those who expect ‘V.I.P. treatment’), you’ll also need to possess good interpersonal skills and to understand the importance of teamwork and professional service.